KATE SMITH IS WORKING HERSELF OUT OF A JOB. She doesn’t seem to mind. It's all part of our love/hate relationship with automation. Kate (not her real name) works as a cashier at a Home Depot store in Ottawa. She’s happy there: working her cash, and often helping customers trying to navigate the automated self-checkout machines. She says it’s fine with her if some cashiers prefer to stay at their stations. But she’s happy to join those who welcome the opportunity to “bop around” at the self-checkout. Self-checkouts are likely to eventually wipe out cashier jobs. But automation is bringing even bigger changes to the way we shop—and work. Amazon has unveiled their grocery prototype store, Amazon Go, in Seattle. You walk in, swipe a bar code on your phone, grab a bright orange Amazon bag and fill it with products from the shelves. When you are done, you just walk out and the receipt is e-mailed to you before you get to your car because Amazon has tracked every interaction you’ve had with their products. No cashiers. No line. No interaction with another human being while shopping ever again. Great, right? Not really. But resistance seems futile. Bread & Roses reported that this meme had more negative responses than anything else they’d ever posted—most replies saying that automation is inevitable. 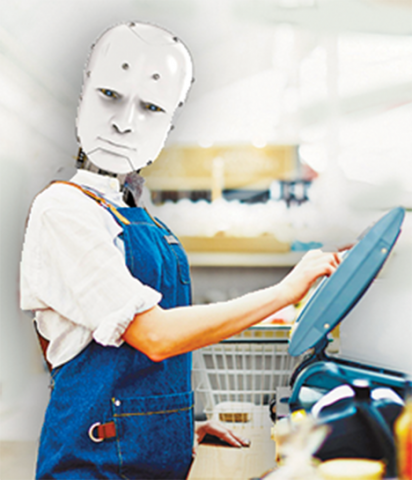 Labour Canada statistics show there are 260,190 Canadians working as cashiers. Most of them are women. Many are heads of households. That’s a lot of people to put out of work. But we tend not to think about that very much. The truth is we have a love hate relationship with technology: We love having everything we want when we want it with the least amount of effort, and we also hate the impact it has on jobs — but only after those jobs have been eliminated and leave a devastating impact on families and communities. There is no strong support for a campaign to save cashier jobs—no more than there ever was to improve the jobs to begin with. Grocery cashiers often handle more than three tons of items during an eight-hour shift. They may flick their wrists up to 600 times per hour. And, unlike their counterparts in the rest of the world, cashiers in North America usually must perform their work standing up, with the additional medical problems this causes—including doubling the risk of heart disease. The introduction of electronic scanners in the mid-1970s sped up the processing of purchases to an enormous extent, at the cost of a significant increase in repetitive strain injuries (RSIs). In an early survey of BC supermarket cashiers shortly after scanners were introduced, between 30-50% of them reported pain in the shoulder, wrist, neck or back, which often required time off and medical attention. Unsurprisingly, then, well-meaning calls for boycotting self-checkout lines have met with some controversy. It’s true automation eliminates jobs. It’s also true it can eliminate dangerous, unpleasant, poorly-paid work. At least in theory, employees can be retrained for more rewarding, less hazardous jobs. Some confidently predict that retail cashiering—and many other in-store occupations—will rapidly disappear, perhaps even within a decade or two. Under this scenario, millions of people in North America could lose their jobs in a “retail apocalypse.” Others point to the obstacles and uncertainties, both technological and human, in the way of such radical change. Some major stores are actually moving away from self-checkout, for example, discovering that their customers far prefer human interaction. But artificial intelligence and other technological innovations cannot fully replace the human element, as even many of those hailing the supposed transition will concede. At least some retail workers may be on the verge, in fact, of significant upskilling, becoming better-paid customer advisors who are deeply knowledgeable about the products on offer. Training and retraining, as always, is a key issue for both employers and labour, as job functions are eliminated and others created by advances in technology. For Kate at her Home Depot store, there are some immediate benefits of automation, even if unintended. Could there be longer term benefits for workers as well?